Many of Asia’s glaciers are retreating as a result of climate change. This retreat impacts water supplies to millions of people, increases the likelihood of outburst floods that threaten life and property in nearby areas, and contributes to sea-level rise. 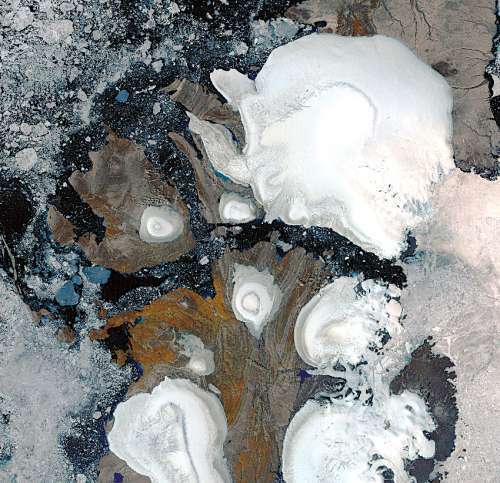 Landsat image of ice caps in northern Savernaya Zemlya, Russian Arctic Islands. The U.S. Geological Survey, in collaboration with 39 international scientists, published a report on the status of glaciers throughout all of Asia, including Russia, China, India, Nepal, Bhutan, Pakistan, Afghanistan, Georgia, Kyrgyzstan, Tajikistan, and Kazakhstan. This report is the 9th in the series of 11 volumes to be published as the USGS Satellite Image Atlas of Glaciers of the World.